Select the Service order you want to view. You can use the options at the top to filter by Code or the Party that the order is linked to. Extracted – the total volume of wine extracted. Note: An asterisk here means you can mouse over for more information. In this example there is still Must on skins yet to be pressed. Select the Charges tab for more detailed information about specific charges. Under this tab use the filters at the top to Search for charges linked to this service order. Click Search to show charges matching the search criteria. Type – allows you to select the Charge capture itself in order to edit all the charges linked to that capture. This is useful if you want to remove a charge that hasn’t been invoiced yet or even reverse one all together. 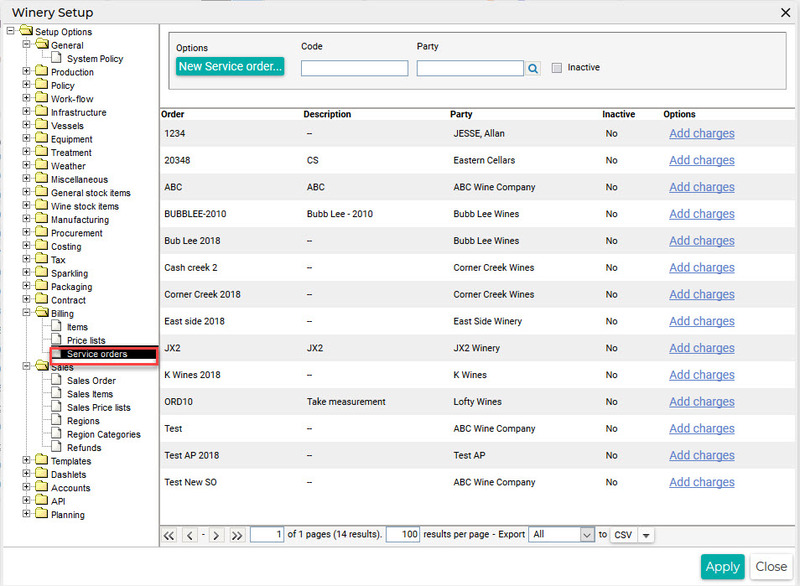 Summary – clicking on this link takes you to the actual winery operation or stock action to which the charges relates. Invoice# – Clicking on the Invoice number prints a PDF version of the invoice. Product – This link takes you to the batch or stock item that is linked to the charges. Ext Ref – This link takes you to the linked invoice in Xero (accounting integration enabled).